Location: Mountain View Aparthotel is located just opposite the central ski slope in Bansko, 200 meters from the Gondola lift. 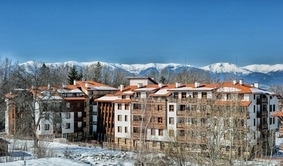 The hotel enjoys a convenient location 800 meters from the center of Bansko and its main shopping street Pirin. Accommodation: All apartments feature a TV with cable channels, a living room, a dining area and a fully equipped kitchenette. The bathroom comes with a shower and a hairdryer. Ironing facilities are available on request. Some apartments offer a private balcony with mountain views and ski slopes. Bars and restaurants: A variety of traditional Bulgarian dishes are served at the aparthotel's seasonal à la carte restaurant. A snack bar is also available. Facilities: An indoor pool, a sauna and a seasonal hot tub are at guests' disposal. Additional services and amenities available for extra charge include massages, airport transfers, a ski school, ski equipment and an underground garage.